The Sydney based Waratahs are, and should be, the benchmark team for Australian rugby. They represent their country’s main rugby centre and the most populous city in all of Australia and the Oceania geographical region. With 5,2 million people, in a country with 24,6 million people, almost a quarter of all Australians live in or around Sydney. The Waratahs should thus be the leaders and innovators in Australian rugby. They have all the advantages and very few disadvantages in their hometown location. Which gives reason for some surprise at their ongoing lack of success over the years. 10thon the overall log in 2016, winning 8 of their 15 starts, all against fellow Australian teams and the likes of the Sunwolves and the Kings. 16thin 2017, winning just 4 games in 15 starts, and finishing just above the Kings and the Sunwolves on the overall log. 2018 was a little better. Sharing log point position with the Highlanders, on 44 points, but sitting at 6thon the log as they lost one game more than the Highlanders, winning 9 of 16 starts. This somewhat better log position must again be tempered by mentioning that these results were achieved in a double round of fixtures against fellow Australian teams, which included the Sunwolves in 2018. Despite their location, their feeder population, and their advantage of playing out of Australia’s main rugby area, the Waratahs continue to mostly flatter to deceive. Daryl Gibson has been given a one-year extension to his contract as Head Coach, and the ‘Tahs have brought veteran Chris Whittaker on board as their new backs coach. Whittaker has over 100 caps for the Waratahs to his credit, and brings vast experience and credibility to the coaching squad. The ‘Tahs have assembled what looks like a good squad for 2019, with some astute signings to bring fresh blood into the team. However, as in the past, the Waratahs suffer from something of a leadership issue, with some wayward captaincy and their senior players not stepping up to be counted when they are needed. There are suggestions that the real issues facing the Waratahs, and Australian rugby as a whole, can be found in the attitude of entitlement and arrogance amongst some of the senior players. Assistant Coach: Chris Whitaker, Attack and Backs. Assistant Coach: Steve Tandy, defence. The Waratahs have retained the bulk of their 2018 squad. The biggest loss is the departure of Taqele Naiyaravoro to the Northampton Saints. His bulk and finishing ability will be missed. Andrew Kellaway has also joined Naiyaravoro overseas, while both Hugh Roach and Brad Wilkin have gone to the Rebels. Beyond that, Irae Simone, Michael Snowden, Kelly Meafua, Kalivati Tawake and Matt Sandell have also departed, along with the experience of Paddy Ryan. The signing of both Karmichael Hunt and Adam Ashley-Cooper has been confirmed, together with the arrival of the young South African lock Le Roux Roets, who bulk up their tight five during the 2019 campaign. Rory O’Connor comes in at prop and John Folau, brother of Israel, joins as an outside back. With captain Michael Hooper and fullback Israel Folau committing themselves to long term contracts with the ‘Tahs, the future leadership and spine of experience seems guaranteed, although many question Hooper’s value as a captain – he makes far too many decisions based on emotion rather than logic, and has often been found wanting in the disciplinary stakes. His wayward decisions have often cost both the Waratahs and the Wallabies possible victory in crucial games. The return of Adam Ashley-Cooper and the signing of Karmichael Hunt should also add to the back division’s firepower in 2019. Ashley-Cooper’s return signals his intention to challenge for a Wallaby call-up for the World Cup in Japan, and this might serve as additional motivation for both himself and those around him. He brings vast experience, including 78 Super Rugby caps with the Brumbies, another 61 with the Waratahs, 37 with the Bordeaux Beagles, and a total of 116 Wallaby caps to boot. One note of caution: Ashley-Cooper will be 35 in March, and the years of high-impact rugby will begin to tell. Is he still physically able to take the punishment of a Super Rugby season? No.8 Jack Dempsey has something to prove, both to himself and to the Aussie selectors. Injury has hampered his progress since his arrival on the scene in 2015, and he didn’t get much chance at international level until last year’s Test against the All Blacks in Japan. He may well provide some steel to the loose trio in 2019 alongside Michael Hooper and sometime lock, Ned Hanigan. There seems to be a hole in the squad with regard to midfielders. Just two specialist centres are found in the 2019 squad, Kurtley Beale, and Lalakai Foketi, which indicates that a number of “utility” players may find themselves playing outside of their preferred positions, the likes of Alex Newsome, usually a winger, Israel Folau, Curtis Rona, another win, and even Karmichael Hunt. Another issue to be considered: A squad loaded with aspirant World Cup players such asBernard Foley, Michael Hooper, Kurtley Beale, Karmichael Hunt, Ned Hanigan, Jack Dempsey, Sekopu Kepu, Rob Simmons, Jake Gordon, Adam Ashley-Cooper, Tom Robertson, Tolu Latu, Jack Dempsey, Curtis Rona, Jed Holloway and Israel Folau may present some challenges if the Wallaby management’s focus on nurturing and resting their possible Wallaby selections through the season comes to pass. I am not sure the Waratahs have the depth to fill the shoes of players being rested. Props: Tom Robertson, Harry Johnson-Holmes, Sekope Kepu, Shambeckler Vui, Cody Walker, Chris Talakai, Rory O’Connor, Angus Bell. Hookers: Tolu Latu, Damien Fitzpatrick, JP Sauni, Andrew Tuala. Locks: Rob Simmons, Le Roux Roets, Ned Hanigan, Ryan McCauley, Will Harris, Tom Staniforth, Jeremy Williams. Flankers: Jack Dempsey, Michael Hooper, Will Miller, BJ Edwards, High Sinclair, Rory Suttor, Lachlan Swinton. 9: Jake Gordon, Nick Phipps, Mitch Short. 10: Bernard Foley, Mack Mason, Will Harrison. Midfielders: Kurtley Beale, Lalakai Foketi, Alex Newsome. Wings: Curtis Rona, Cameron Clark, John Folau, Adam Ashley-Cooper, Ben Donaldson, James Ramm. 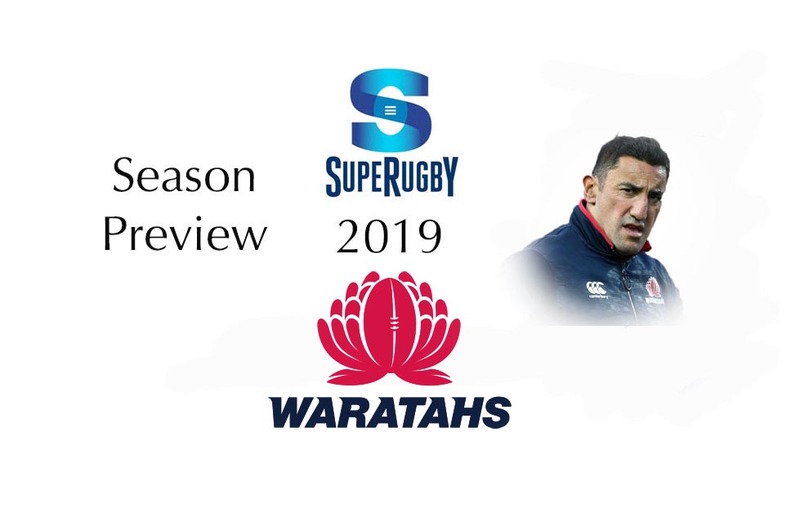 The Waratahs will dominate the Australian conference, but will continue to struggle against teams from outside Australia. Their away games will be something of a challenge. They will qualify for the playoffs as the Aussie conference winners. Previous articleSeason Preview: The Sunwolves. Next articleLegendary Springbok Carel Du Plessis undergoes brain surgery.